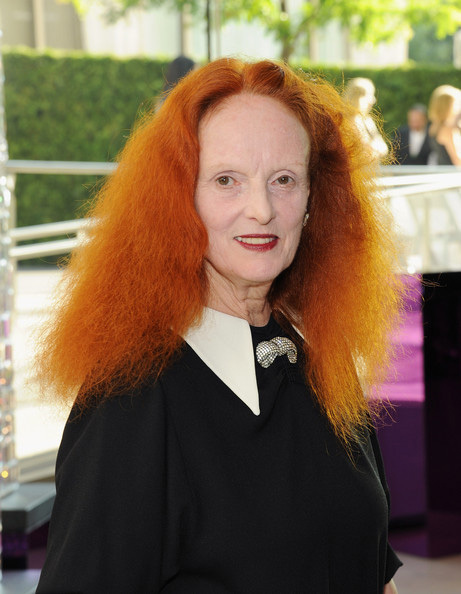 Grace Coddington, Creative Director of Vogue. Photo by Larry Busacca/GettyImages North America. The September issue of Vogue, with some great styling by Grace Coddington, the Creative Director, has me excited to think that by this time next year there may be a Grace Coddington memoir to enjoy alongside the 2012 September issue. Grace sold the rights to her upcoming memoir to Random House (for $1.2 million) and will co-write it with Michael Roberts, a Vogue writer. It will cover her modeling days in 1960s London, the car accident that changed her career path, her early days as a stylist and editor at British Vogue, and later, American Vogue. Grace, who was so charming and wonderful to learn about in the documentary The September Issue, turned 70 in April of this year. I hope there will be lots of pictures of her modeling days. This editorial she styled for the September issue, “My Generation,” makes me think a picture of Grace from the 60s would fit right in next to Natalia’s. Natalia Vodianova in a Burberry Prorsum coat. Photo by Mert Alas and Marcus Piggott. Here are a few shots from my favorite September issue ever, 2006, with Kirsten Dunst as Marie Antoinette, which Grace styled, on location at Versailles. 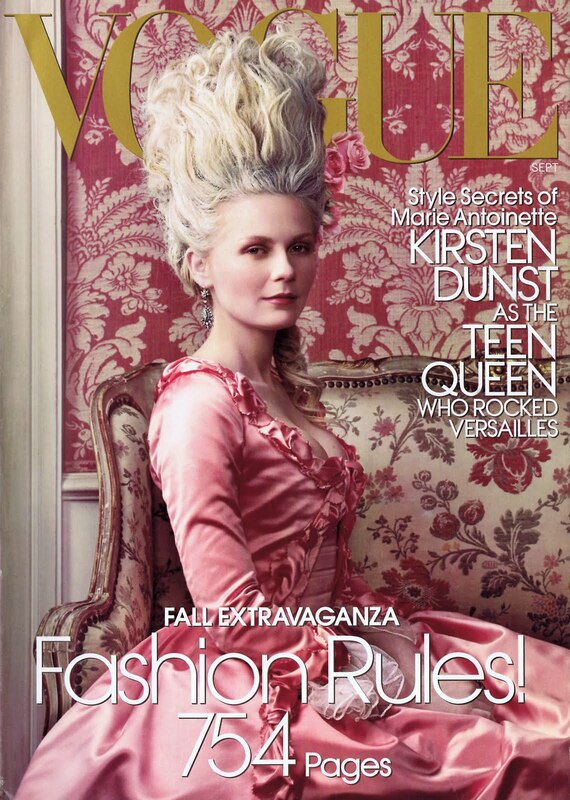 The September 2006 issue of Vogue, featuring Kirsten Dunst as Marie Antoinette in a pink silk dress designed by Milena Canonero and produced by GP11 Rome. Ms. Canonero won an Acacemy Award for costume design for Marie Antoinette. Photo by Annie Leibovitz. 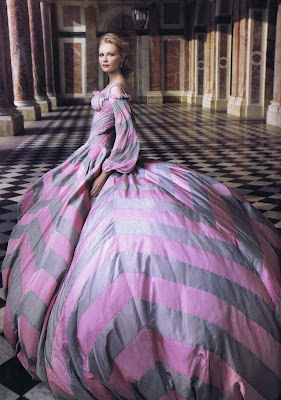 Kirsten in a corseted pink and dove taffeta and chiffon ball gown by Alexander McQueen. Photo by Annie Leibovitz. I hope once her book comes out Grace will do a reading and signing in Manhattan. I would happily wait in line to meet her! I might, just might come to the next IFBC in spring.I would love to bring along my oldest daughter with me. My husband is more a mountain and countryside man. So far is just a dream. It is so cool that you are in NYC...thanks for the heads up..I also would love to read her memoirs...you selected some great looks here! Maybe I could Host a fundraiser to help get me to NYC...with three college loans...it might be awhile! Gorgeous photos - I have always loved reading about Grace, and I'd read her memoirs with pleasure! I think it was in "the September Issue" where a segment on Grace showed her scouting locations...and I was much more struck by her sensibility than Wintour's! I look forward to this memoir...hm, a giveaway perhaps! You are beautiful and so wise. I am a rich womwn having you amongst my friends. Hi Sacramento, please keep me posted on your possible visit to NYC next February. It would be wonderful to meet you and your daughter! Hi Pam, ooh yay, like a rent party, only a 'Get me to NYC for IFB' party, that sounds great. If you actually do that I want to hear all about it! Hi Patti, I am a big Grace Coddington fan, so I can't wait to read her book. I am not seeing a publication date yet but hopefully it will be within the next year or so. Hi Terri, how did the wedding go? I hope you will post about it on your blog. I found Grace to be such an interesting person in 'The September Issue' I am looking forward to more details on her life. I especially loved when she talked about living in Wales as a girl and Vogue coming months after it had been published. Hi Bella, maybe Grace will go on a book tour and you could meet her in SF. I think she will find she has fans wherever she goes (just like you). I "met" Grace in the movie "The September Issue" and immediately fell for her. Hi Paula, "The September Issue" was my first meeting of Grace too. I thought she was so charming, a perfect counterpoint to Anna Wintour, in both looks and personality. I can't wait to read her book.